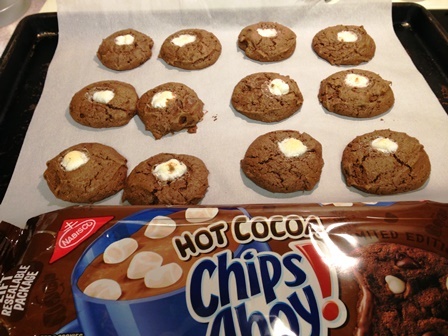 My boys picked out these Chips Ahoy Hot Cocoa cookies from the grocery store the other day. Oh, the torture of having these delicious-looking cookies on my counter and not being able to eat them! So, I set about making my own version of gluten-free, dairy-free Hot Cocoa Cookies. Gluten Free Mama Flour is my favorite for cookie recipes. Coconut oil and applesauce replace the butter, making these soft and dairy-free. Instant pudding and baking cocoa add the hot cocoa goodness. As soon as these were out of the oven, my family was eating them instead of the store bought ones! A day later, only half the batch is left. Next we will have to find a padlock for the cookie tin! I hope you enjoy these cookies as much as we do. In a large bowl, combine the dry ingredients: Flour, dry pudding, baking cocoa, xanthan gum, salt, and baking soda. Set aside. In a stand mixer, beat together the apple sauce and coconut oil. Add the brown sugar and white sugar and continue to mix well. Next, pour in the vanilla and eggs, beat until creamy. Add half the dry ingredients to the stand mixer, blending 15 seconds. Repeat with the remainder of the dry ingredients, blending until all is incorporated. Sprinkle the chocolate chips into the mixer and blend for just a few seconds. Line baking sheets with parchment paper. Using a small scoop, scoop the batter onto the parchment paper, 12 to a pan. Poke one or more mini marshmallows into the center of the cookies. Bake at 350 degrees for 12-13 minutes. Let cookies cool on pan for 2 minutes and then place on cooling racks. Makes 36-40 cookies. Cookies will be moist and chewy, may be re-warmed in the microwave for 5 seconds to experience that authentic “hot cocoa” flavor. 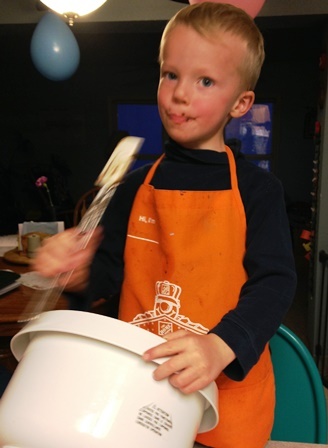 Our little baker was quite eager to clean the mixing bowl for me. This entry was posted in Gluten-free Desserts, Gluten-Free with Your TEA and tagged gluten-free, gluten-free cookies, gluten-free recipes, My Tea Cupp Prayers, recipes, Tea Cup Prayers by Jennifer Grace. Bookmark the permalink.